I have had so many quilters email me and mention having a blog JUST FOR US that many quilters can actively participate in. A blog where we can share what we’re working on, talk about tips, techniques, tools, and how we work. 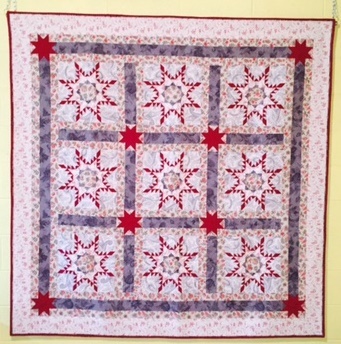 A blog where hand quilters feel quite at home and understand our need to DO IT BY HAND. I hear you, and I totally agree! Within the next few days, I will be posting a link to a brand new blog that will do just that. But I can’t do another blog all by myself. So (1) if you’re a hand quilter, and (2) if you have added a link on this site to a hand quilted item that you have made, AND (3) if you have put the button above on your blog, you are invited to be a part of the new site! You can start preparing now for your first article. 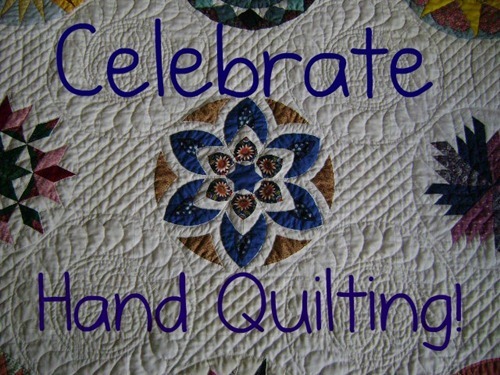 Yes, you can add articles to the new hand quilting blog! Our first series of articles will be sharing about needles and thimbles. So get ready… take a few pictures of the needles and thimbles you use the most, write something that talks about why you use what you do, and when you hear back from me, I will tell you how to put your article on our brand new blog! I think this will be a lot of fun, and I look forward to seeing how it progresses. That sounds fun, Caron! I still have to do my hand-quilting post! This is a great idea! Looking forward to it! that sounds great – I always get questions about my thimble so I am willing to share. I am in! My thimble is already on my website, http://www.quiltingthetownred.blogspot.com. Tell me how to enter! This is so wonderful, how exciting! Wonderful to have found your site, I am a beginner and love stitching patchwork by hand and will quilt by hand too 🙂 The button is on my site, when my quilt is finished I will do the link, Thank You.